Glass is recycled widely in places around the UK, with kerbside collections and some 50,000 bottle banks dotted around the country capturing the 752,000 tonnes of glass that are recycled annually. Glass waste is significant, with families in the UK using around 330 glass bottles and jars a year. The great thing about glass is that it can be recycled infinitely without losing its quality, while using recycled glass in the glass-making process actually reduces energy consumption. The glass recycling process involves melting the glass and cutting it into the desired shape. Recycling glass produces environmental benefits, with the energy saved by recycling one glass bottle enough to power a TV for 20 minutes. 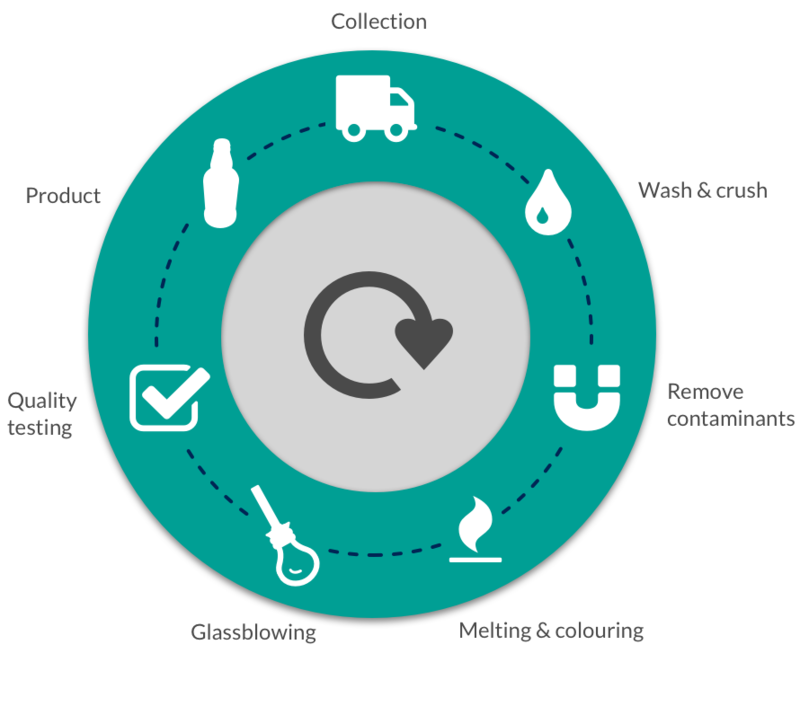 Glass recycling is not without its difficulties, however, with most concerning the removal of contaminants, such as sticky labels, and avoiding mixing different coloured glass. You can learn more about how to recycle glass on the Recycle for Wales website. Collection: Glass is collected from kerbside or bottle banks. This is either sorted at the bottle bank into clear, green and brown glass or done so at a glass treatment plant. Washing and crushing: Glass is then washed to remove impurities and then crushed to make ‘cullet’. Remove contaminants: Cullet is passed through a magnetic field to remove ferrous metals, paper and plastic are picked up manually or by an automated process, and ceramics are removed by passing the cullet through various screens, leaving a ceramic residue. Melting and colouring: Cullet mixed with sand, soda ash and limestone is placed in as furnace, with as much cullet as possible to make the other materials melt quicker. The melted cullet is then oxidized to make it grey and is used as a base to add colorants. Glassblowing: The glass is then cut into ‘gobs’ and individual pieces go into moulds, where they are pressed and blown into the shape of a bottle or a jar, for example. Quality testing: Bottles undergo quality control with any faults found fed back to machine operators who can make adjustments at source. Product: The glass containers are sent off to retailers, filled with products, and then sold to consumers, or sent to establishments that require empty glass containers, like pubs and restaurants. Where does Wales’ Glass recycling going?